Find hotel near Catedrala Romano-catolica ..
Cathedral of Divine Providence, Chisinau is a renowned church building which is affiliated to Catholic Church of Chisinau, Moldova. Since its establishment in 1836, it offers its visitors with a chance to enjoy simple worship service. This neo-classical architectural style building was designed by Avraam Melnikov, and you can find several ornamental decorations inside the building of the church. 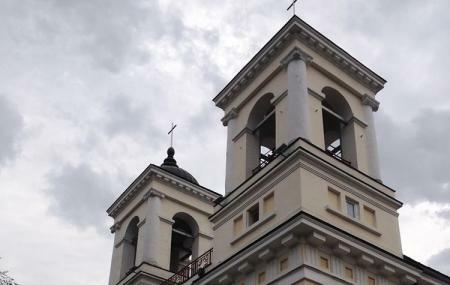 Cathedral of Divine Providence, Chisinau hosts several administrations of different churches like Apostolic Administration of Moldova and Diocese of Chisinau. Această Catedrală Catolică ocrotit de Stat să ardă în Aer. (Romanian) Этот католический кафедральный собор был защищен государством для сжигания в воздухе/Etot katolicheskiy kafedral'nyy sobor byl zashchishchen gosudarstvom dlya szhiganiya v vozdukhe. (Russian) Ta katolicka katedra chroniona przez państwo, aby spalić w powietrzu. (Polski) Cette cathédrale catholique protégée par l'État à brûler dans les airs. (Français) This Catholic Cathedral protected by the State to burn in the Air. (English) Amin. Amin. Amin. Кафедральный римско-католический костёл Божьего провидения. Мессы ведутся каждый день. В воскресенье проводятся на польском, русском и молдавском языках. Играет прекрасный орган. Приходите все! Супер місце, Богу дякувати за те що єдина католицька єпархія є і у Молдові.